For those of you who are looking to upgrade your hygiene armamentarium, here’s something to look at from my friends at Ultradent. The Ultrapro family of hygiene products is pretty special. Ultradent Products, Inc., proudly announces the next generation of the Ultrapro® Txprophylaxis equipment family, including the Ultrapro® Tx Air handpiece, the Ultrapro® Tx Skini prophy angle, and the Ultrapro® Tx Extra prophy angle. For the dental professional who values products that minimize the aches and pains associated with performing prophylaxis, the Ultrapro Tx Air handpiece is designed to reduce hand and arm fatigue thanks to its ergonomic, light-weight, aluminum design and 360° swivel. Its soft-start motor minimizes splatter and is vibration-free to maximize patient comfort as well. The Ultrapro Tx Air handpiece safely performs prophylaxis by reducing friction and heat when polishing the patient’s teeth, allowing it to clean effectively while still protecting the enamel. Its universal e-type motor can be used with other attachments and nose cones, and it can be used with all disposable prophy angles for convenience. The Ultrapro Tx Skini disposable prophy angle offers improved interproximal cleaning, internal blades to reduce splatter, and features a smooth, quiet gear design. Its ergonomic shape minimizes hand fatigue and, with a 20% shorter head and 25% slimmer neck, offers superior access and an unobstructed view for the clinician. The Skini DPA also offers optimal flare, as well as contra-angle and right-angle design options. The Ultrapro Tx Extra disposable prophy angle features external ridges for improved interproximal cleaning and improved internal webbing for reduced splatter. Its ergonomic design and smooth, quiet gear function facilitate the ultimate experience in comfort for both the clinician and the patient. The Extra DPA also features optimal cup flare and is available with a tapered brush. 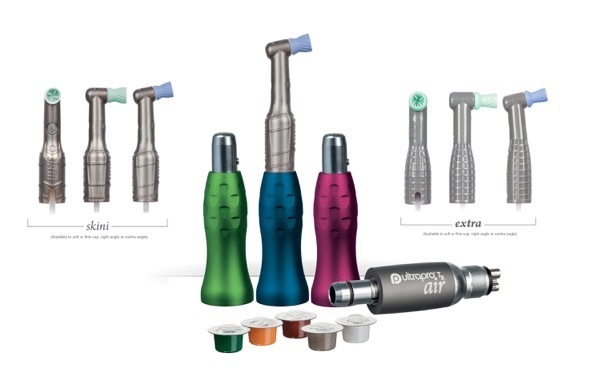 To learn more or to purchase any of the products in the Ultrapro Tx prophylaxis equipment family, please visit ultradent.com or call us at 800.552.5512. Kerr SonicFill 3 is Now on the Market!